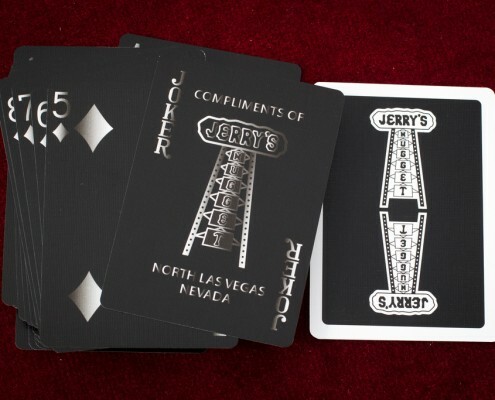 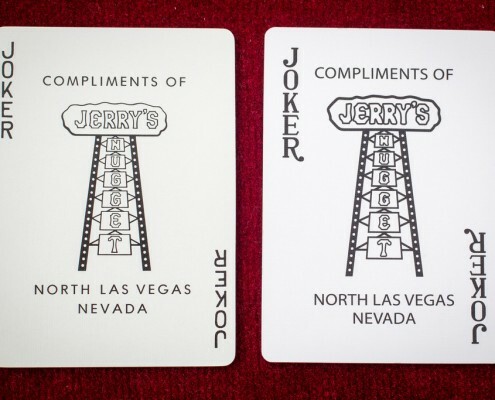 Jerry's Nugget playing cards - Fake or real ? 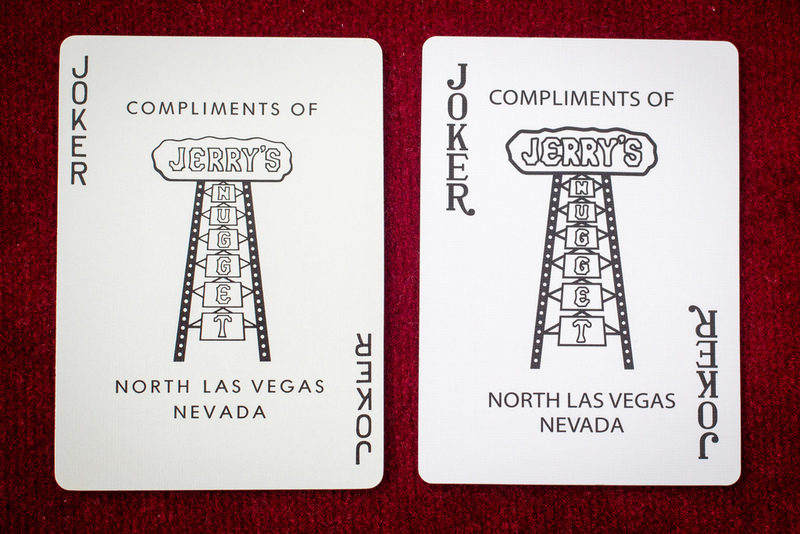 You are here: Home / Jerry’s Nugget, fake or real ? 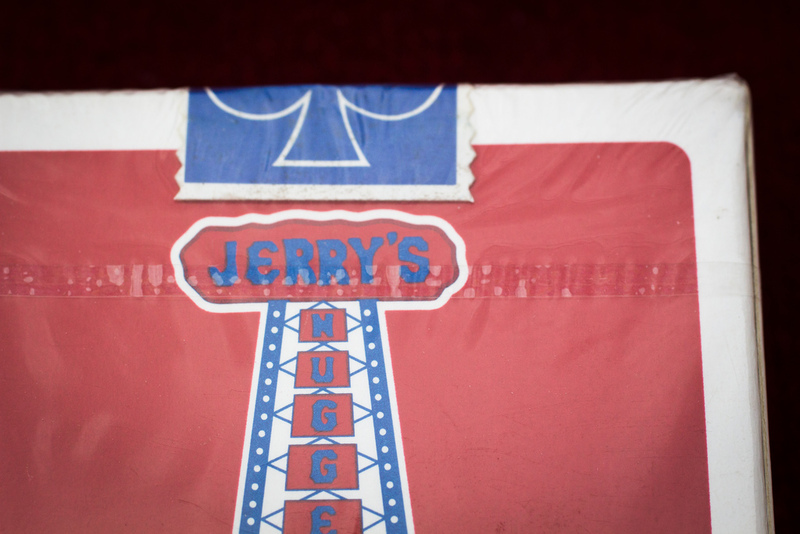 Here are the famous 24 ways to distinguish good Jerry’s Nugget from bad ones. 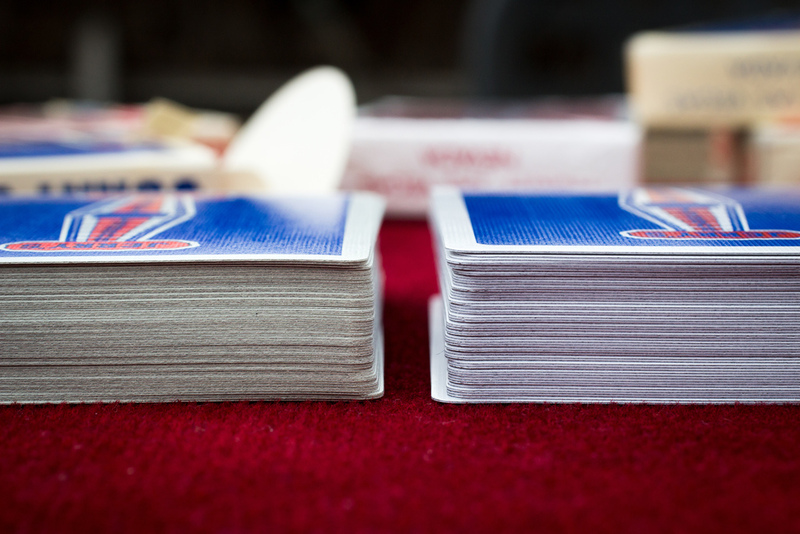 Note : on these photos we can distinguish two types of fakes. 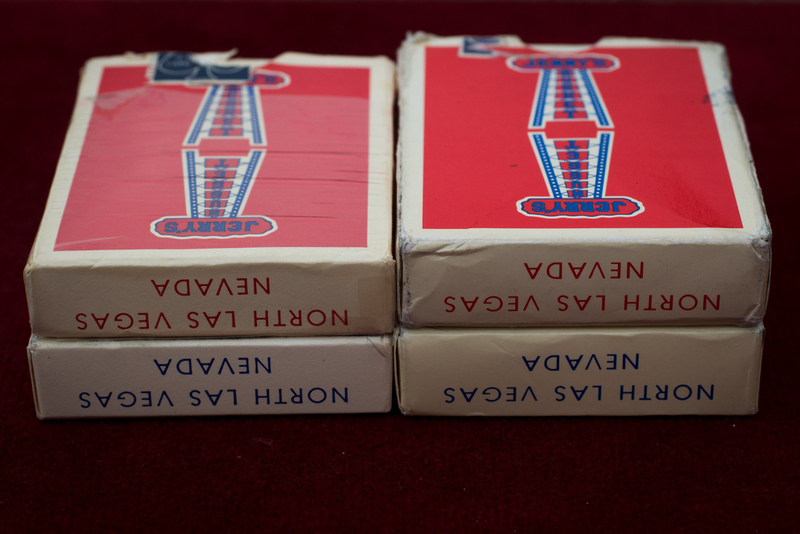 The ones i call Indonesian ones (because my magic shop told me they were coming from this country) which are probably the “reprints” we can find on ebay. 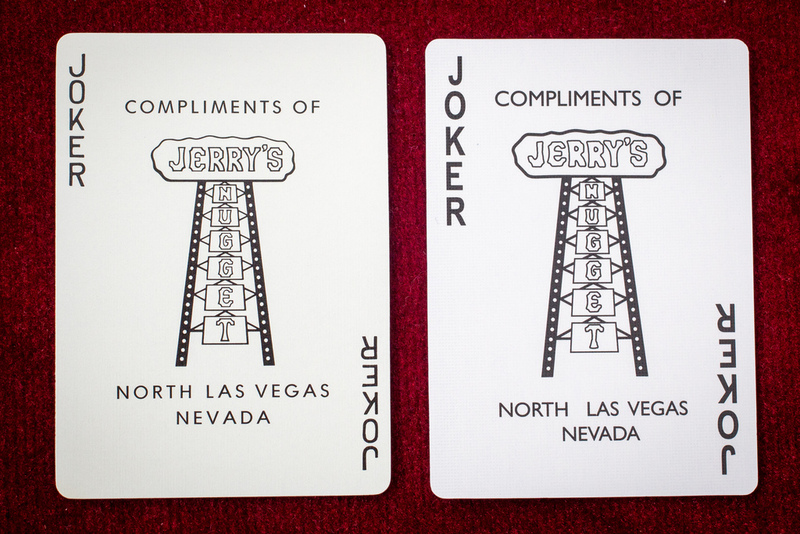 Not so bad cards but absolutely not similar to the real ones. 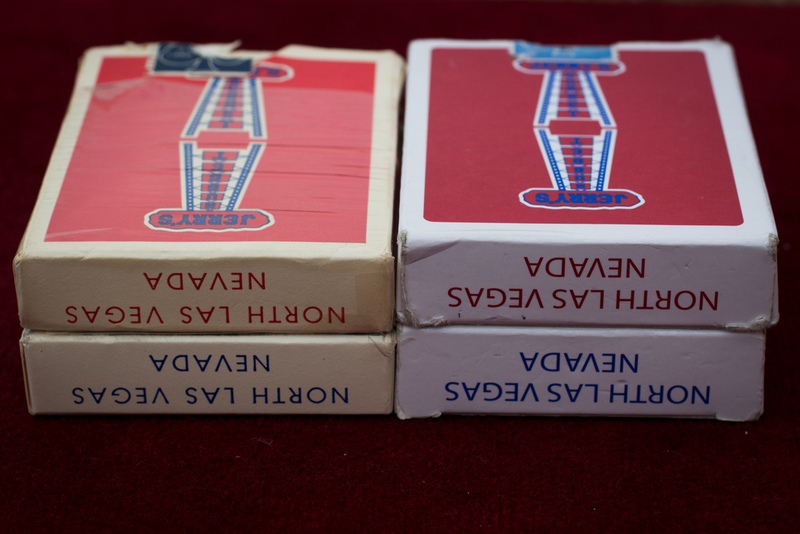 And the other type are called the chinese fakes which are almost perfect fakes with very bad paper. 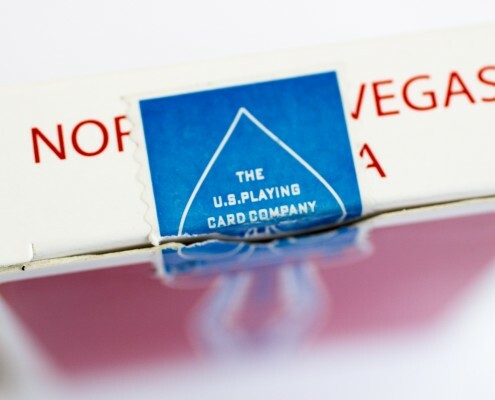 They were probably only produced to be sold as real sealed decks, not to be played with. 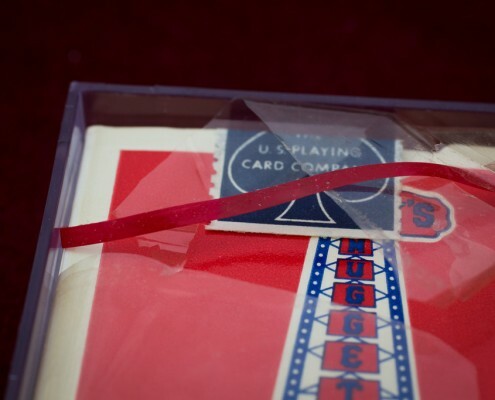 They even look older than real ones ! 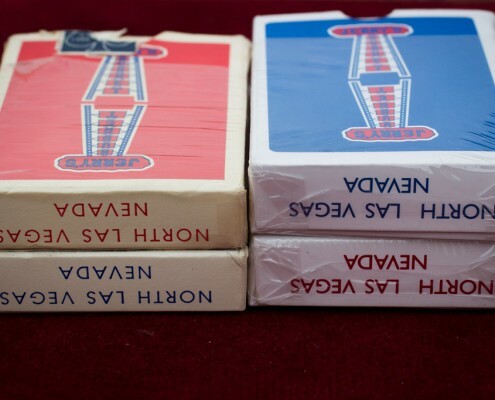 Note 2 : There is now a third version of fakes. 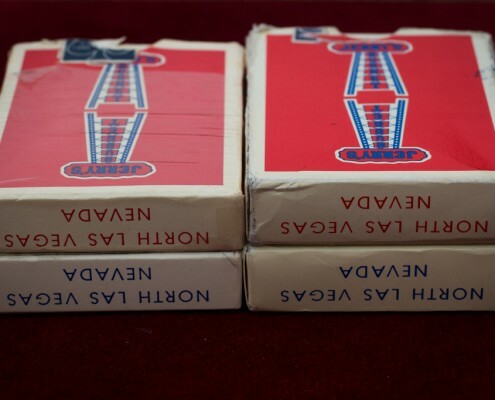 These fakes have a very long flap, a real stamp but the box is bigger than real ones, cards are not good and Fonts are not the good ones on the stamp and the box. 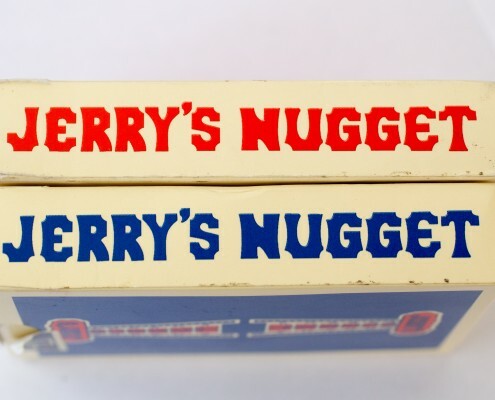 Note 3 : march 2016 – I have started adding information about green Jerry’s Nugget and Chicken Nugget which are not really fakes but only tribute to Jerry’s Nugget. 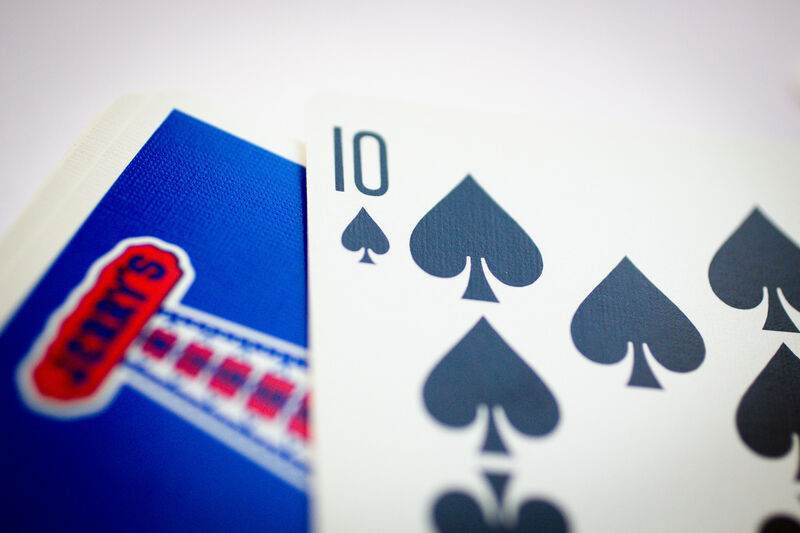 * Fake 1 : Chinese decks which mimic almost all features with very bad cards : only created to fool people. 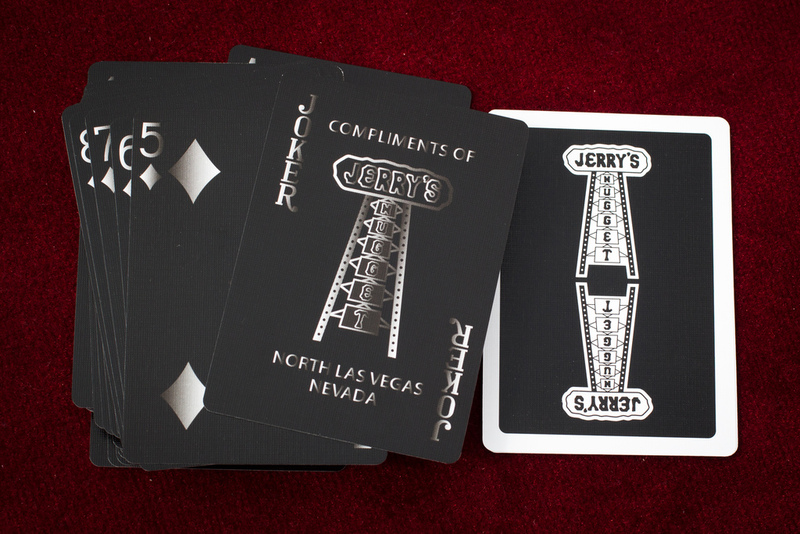 * Fake 4 : Black version of Jerry’s Nugget. 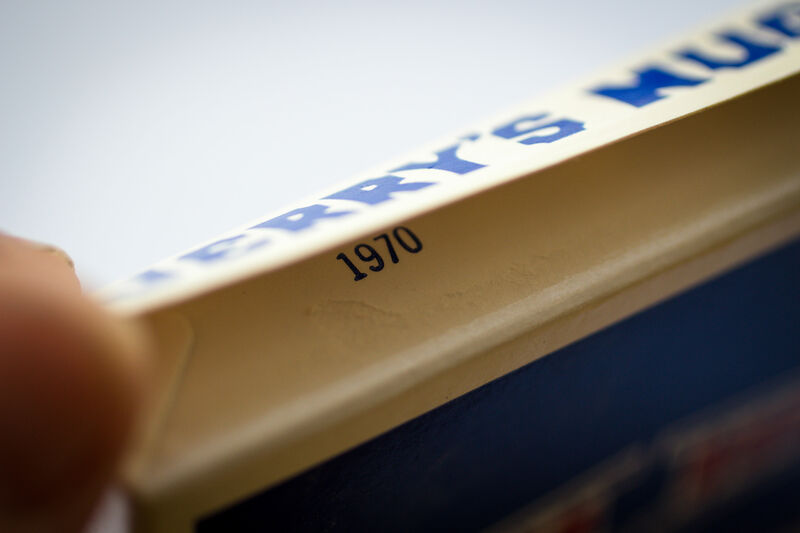 They did not exist in 1970. 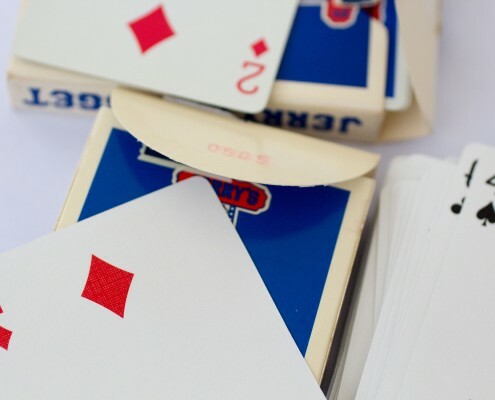 They are always fakes. 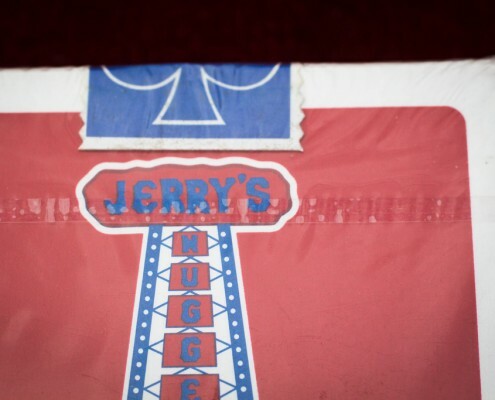 * Chicken : Parody of Jerry’s Nugget created by Hanson Chien and a tribute to Jerry’s Nugget mixed with a McDonalds theme. 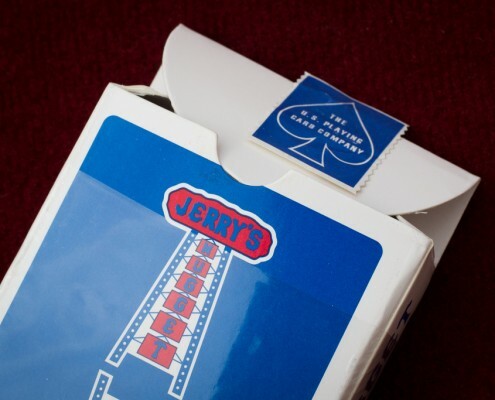 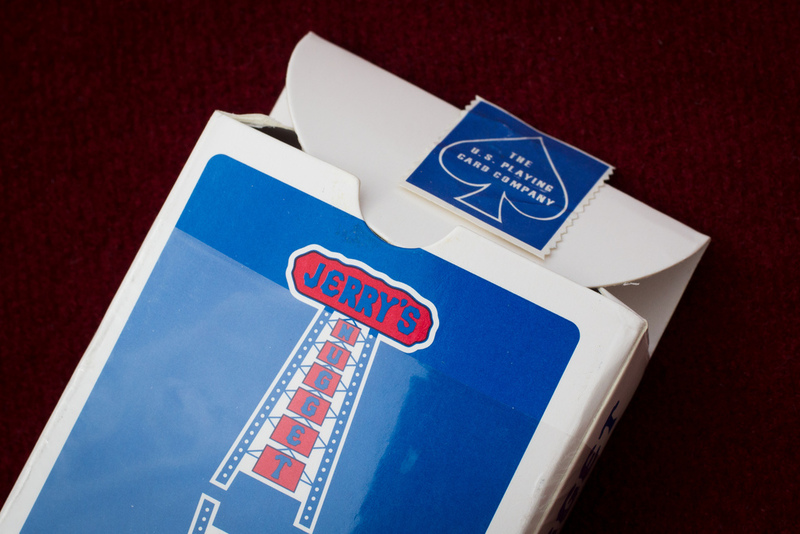 Available in Blue, Red and Black with trick cards (some of them from the first release show Jerry’s Nugget text). 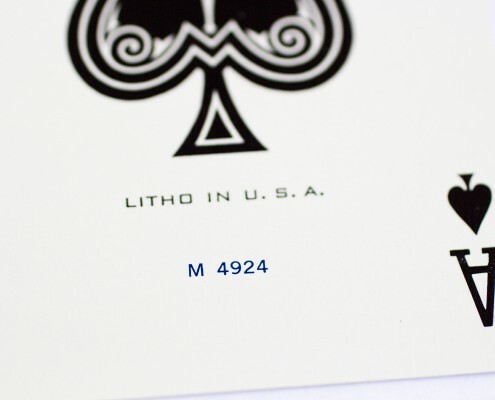 They are also available in White. 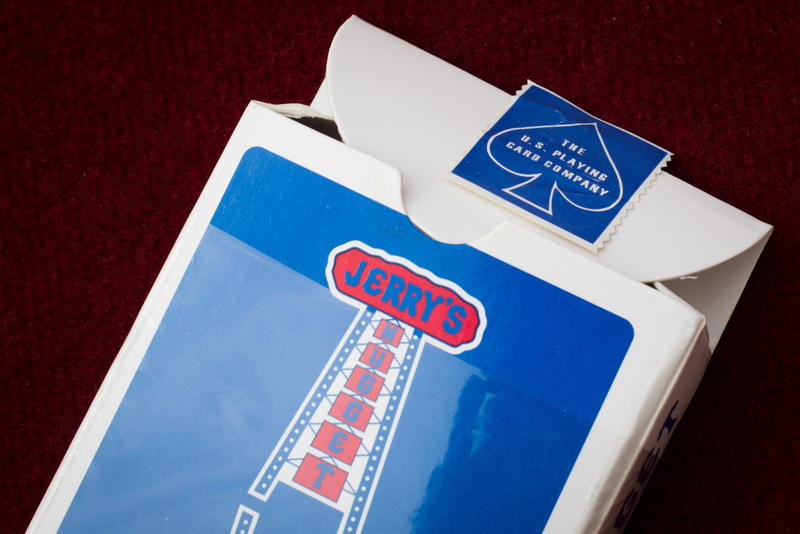 * Kacio : Small print of very special Jerry’s Nugget Tribute. 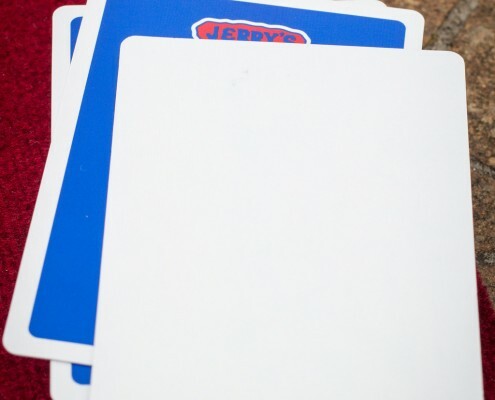 Not included in this survey because they are very different. 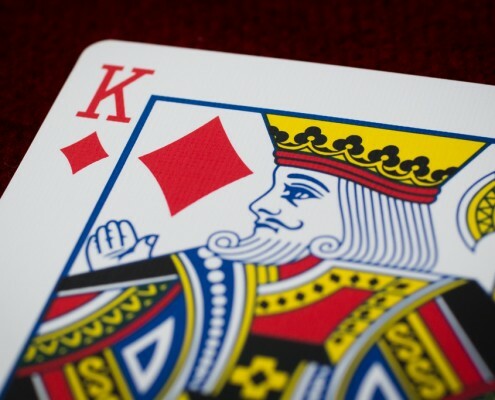 Of course, you can contact me for further details and questions. 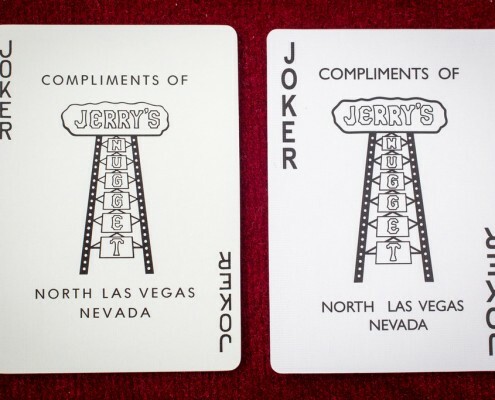 Or if you want to sell cards, I’m always looking for new real, fake, or colored Jerry’s Nugget cards ! 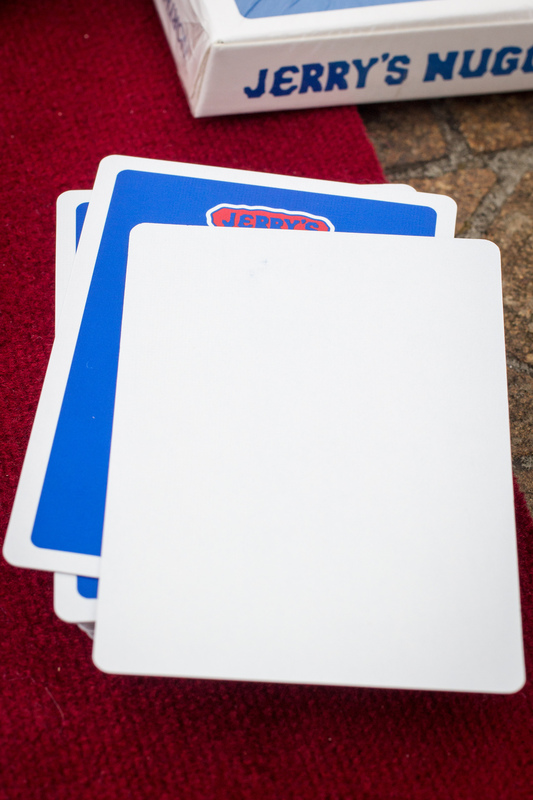 Green : ?? 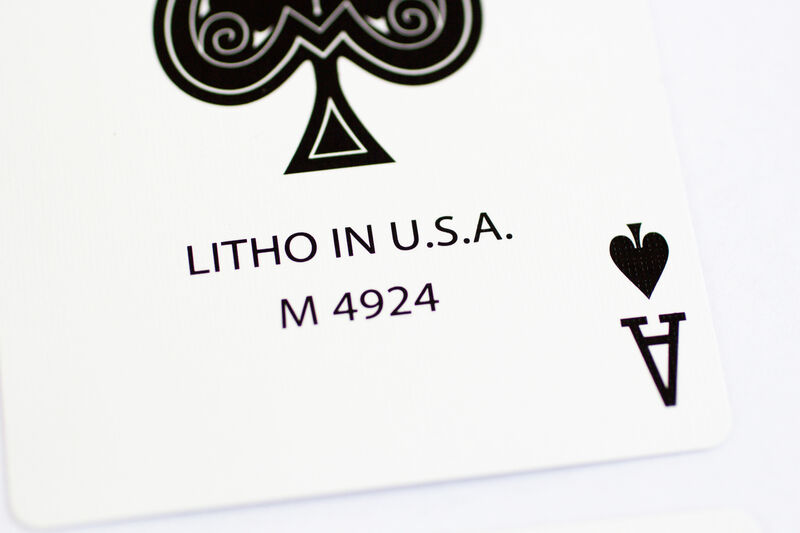 is there a stamp ? 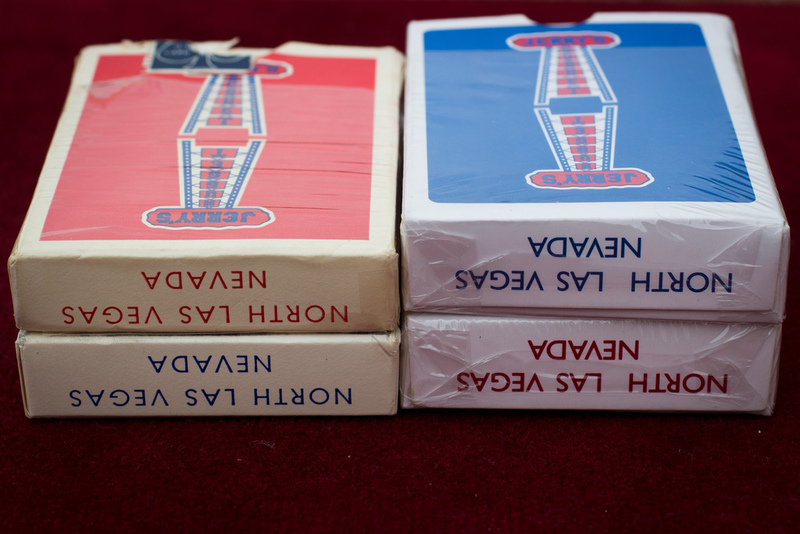 The real one has a real stamp, the fake chinese one has a sticker. 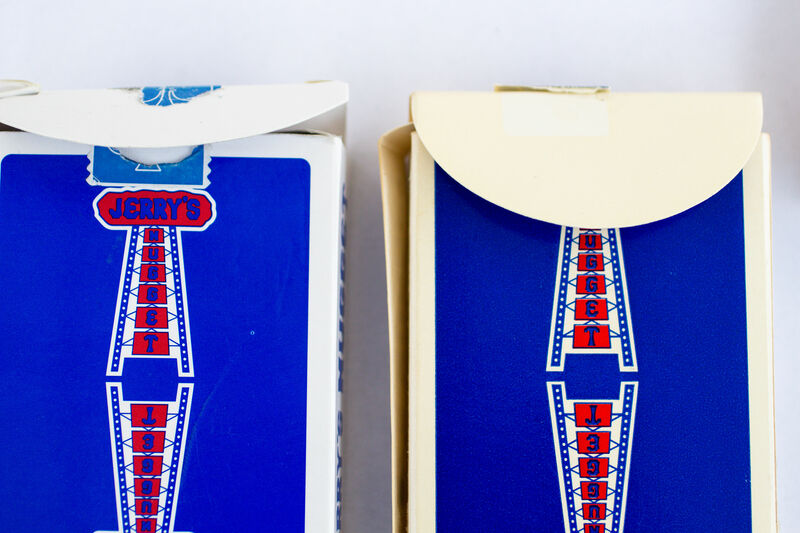 The opening flap must be longer than in most modern boxes. 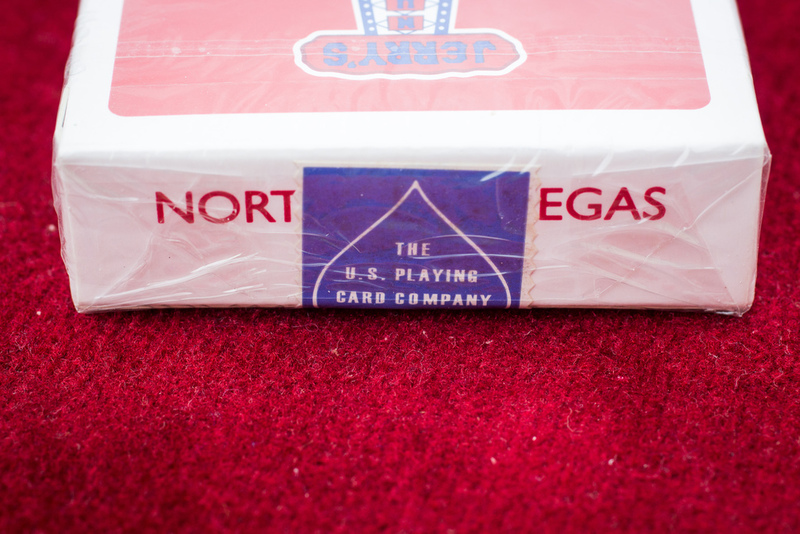 It is not the case with bad fakes. 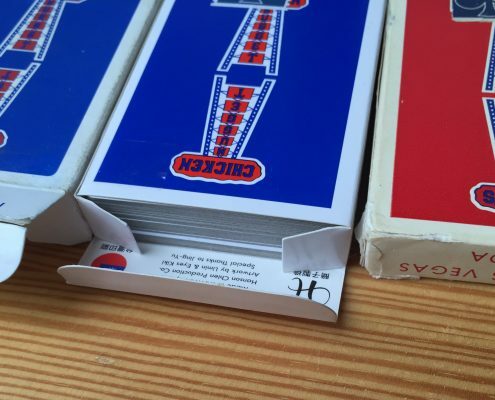 There is no number on the opening flap. 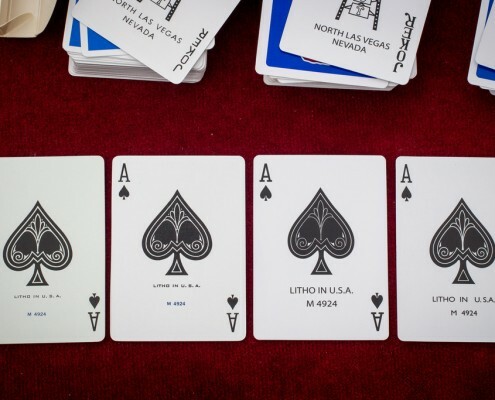 It is only on chinese fakes. 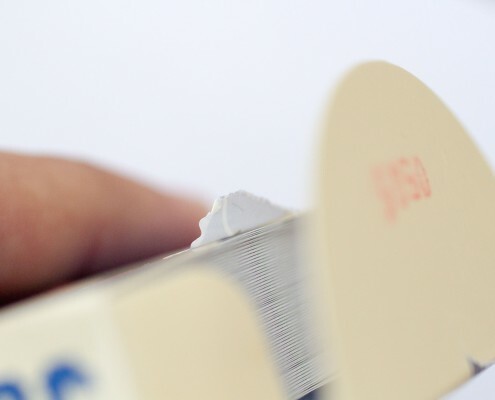 On real boxes, there is a whiter square on the flap just where the stamp is. 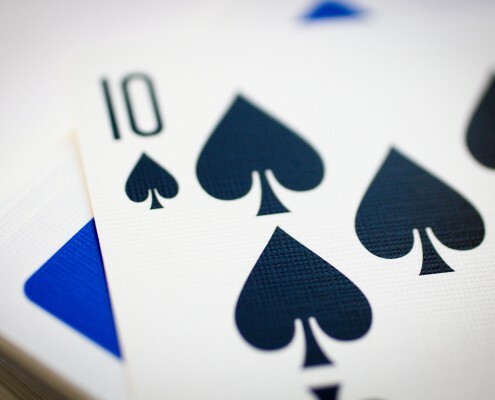 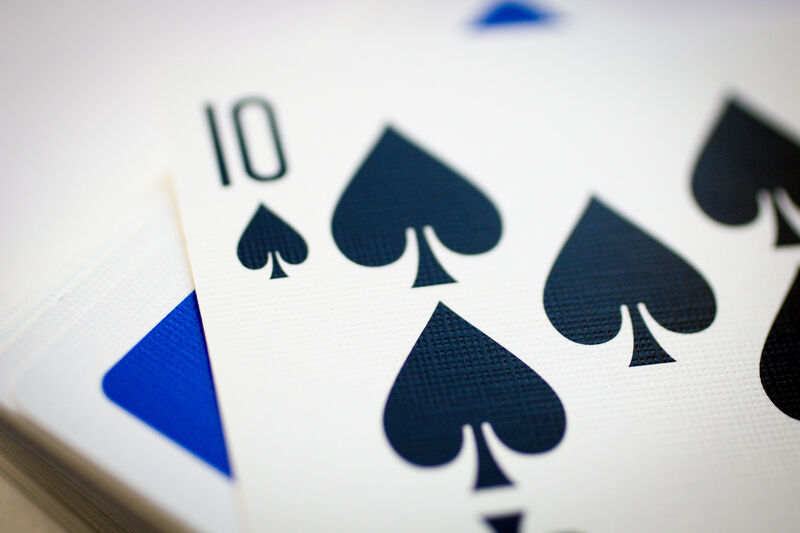 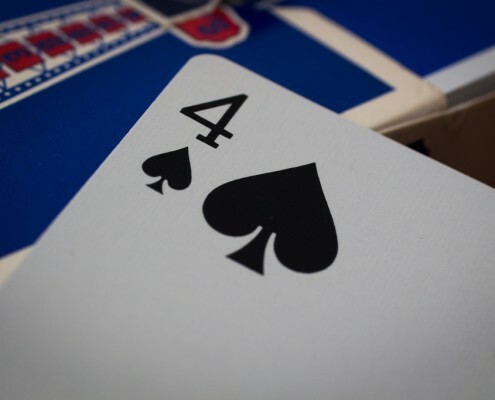 The Ace of Spade has the lot number in blue. 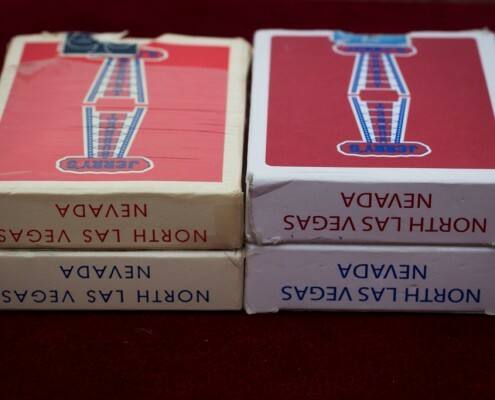 The fake indonesian are really bad with no different colors whereas fake chinese are almost perfect copies. 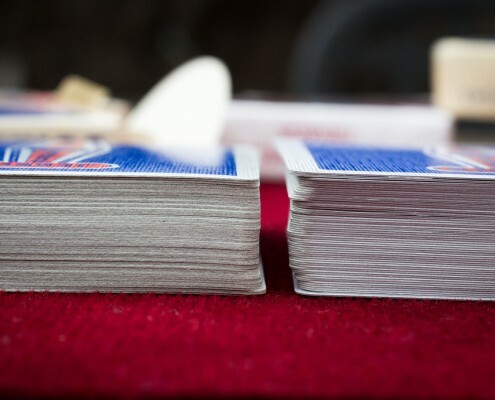 The real ones and the chinese fakes contains only 52 cards + 2 jokers while the indonesian fakes contain 1 card with blank face and one totally blank card. 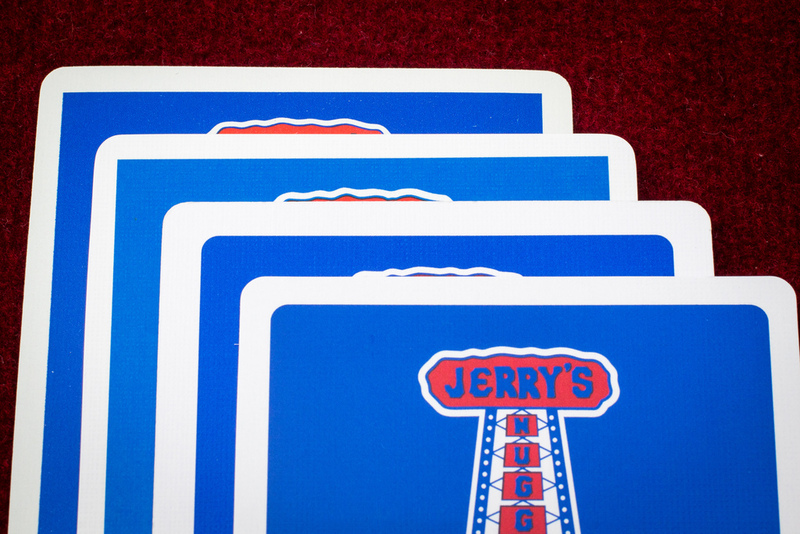 I can’t show you that but real Jerry’s Nugget’s cards smell. 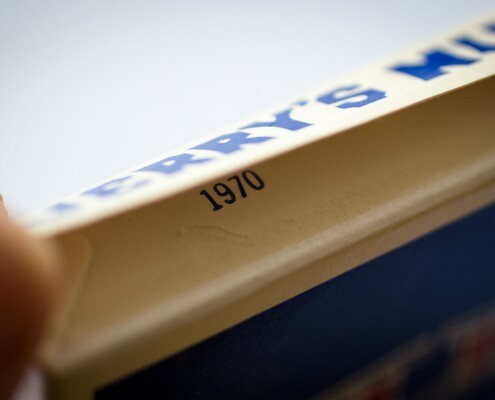 Even 40 years later, they have a specific chemical smell. 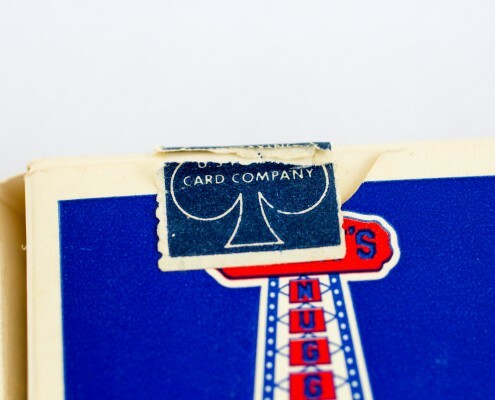 It is not the same as new USPCC cards nor the same as vintage Golden Nugget. 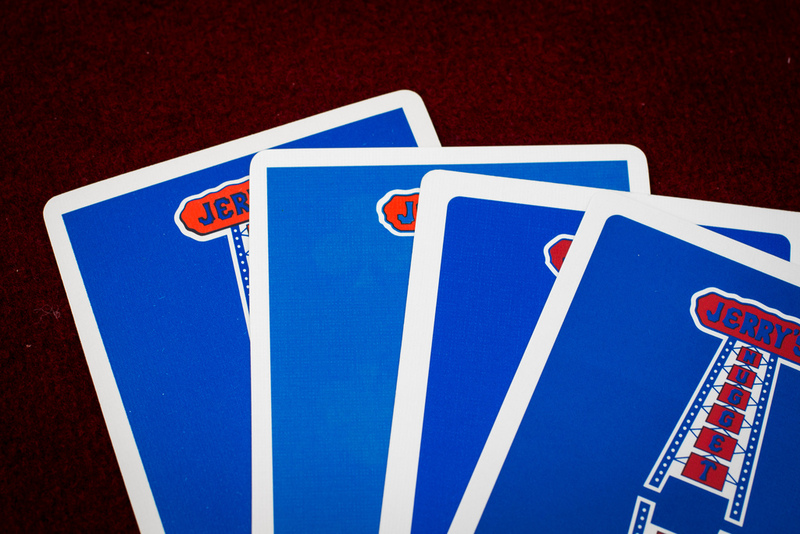 The sound when you shuffle is not the same as with new cards because of the stock and the special coating. 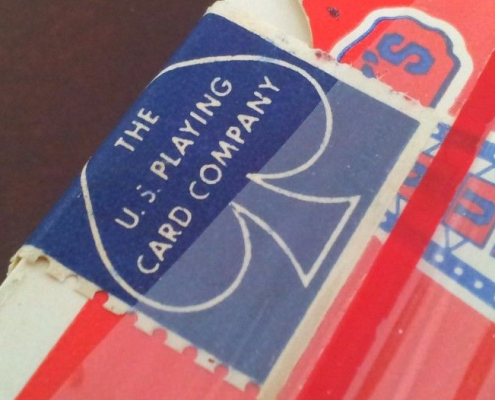 With the genuine deck, if you cut the box, you can see a 1970 stamp. On the fake chinese there is a bad stamp with 2010 on it. 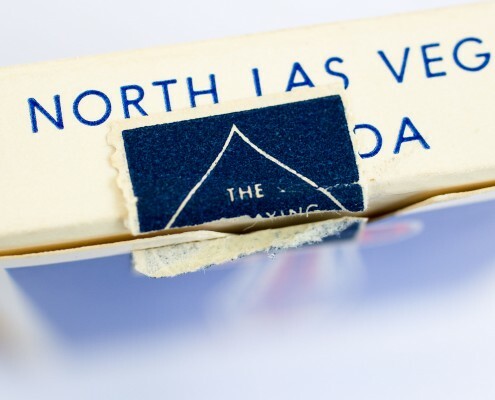 On the indonesian, nothing appears. 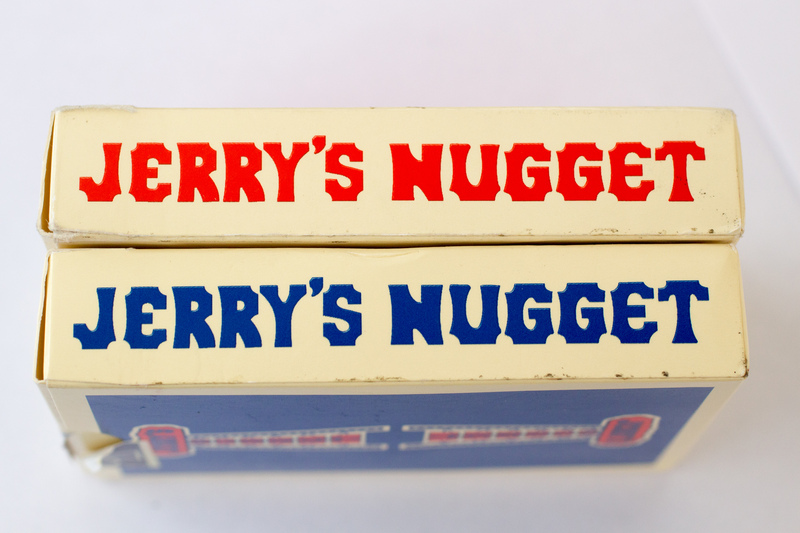 The box of Real Jerry’s Nugget is thinner than other decks. 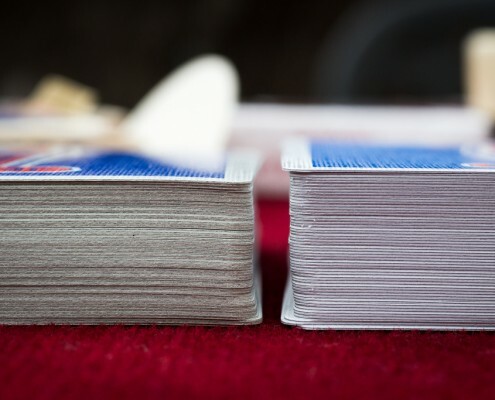 Some people say that normal deck are 18mm thin while JN are 16mm thin. 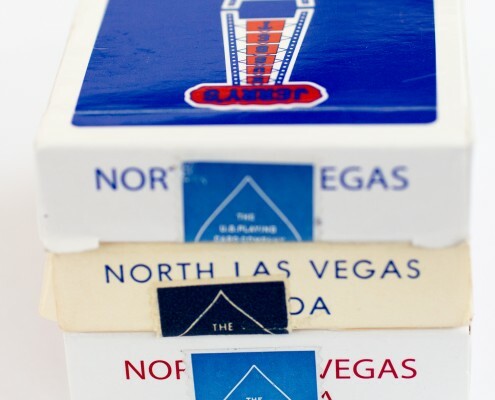 Other vintage decks like Friars Club also used thinner boxes. 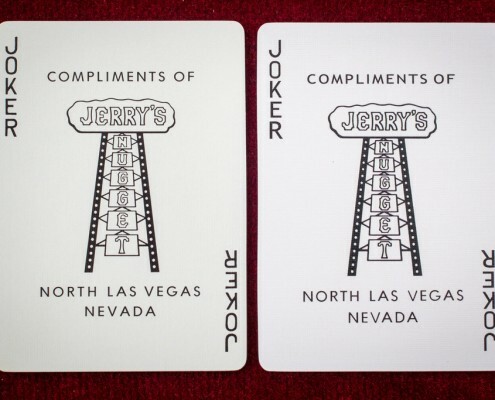 Jerry’s Nugget’s cards are white bordered. 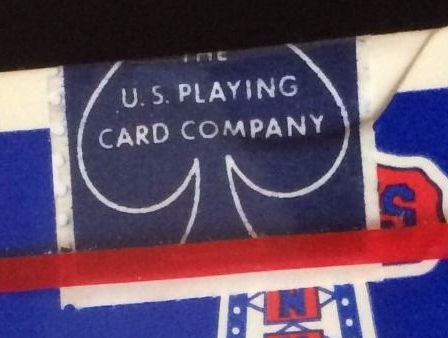 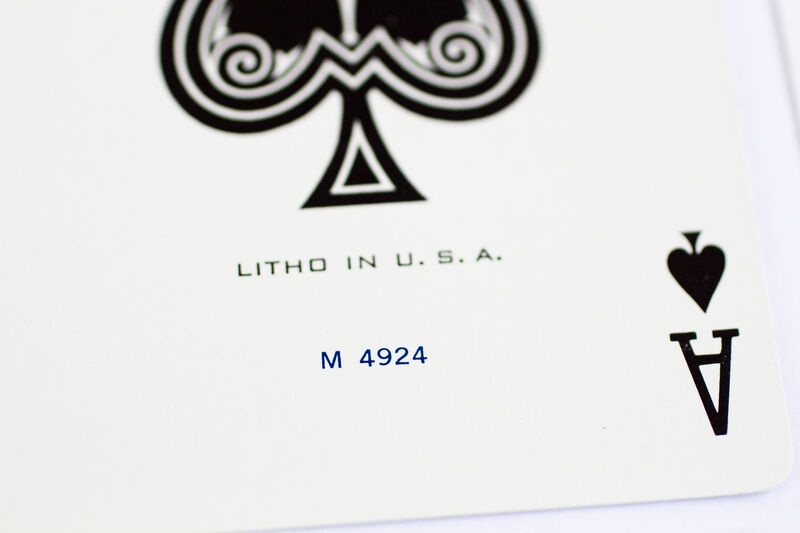 But the white border is smaller than most of other decks of the USPCC. 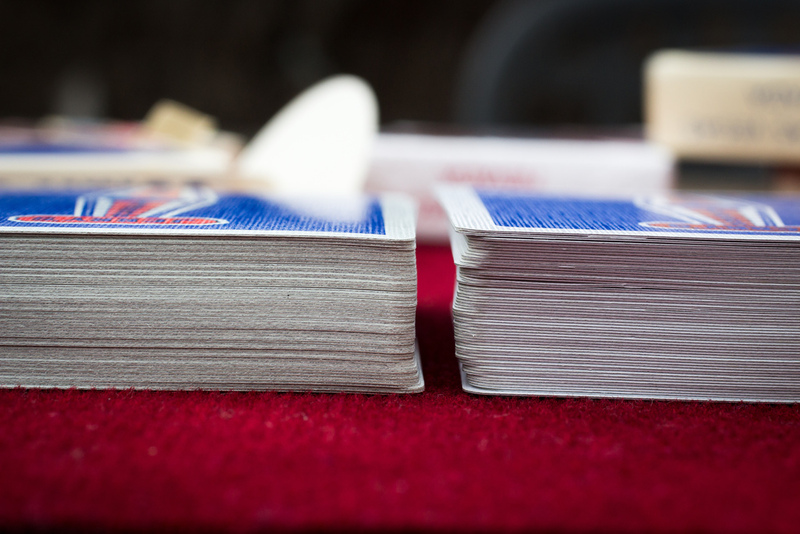 And they are smaller on real deck than on fake decks. 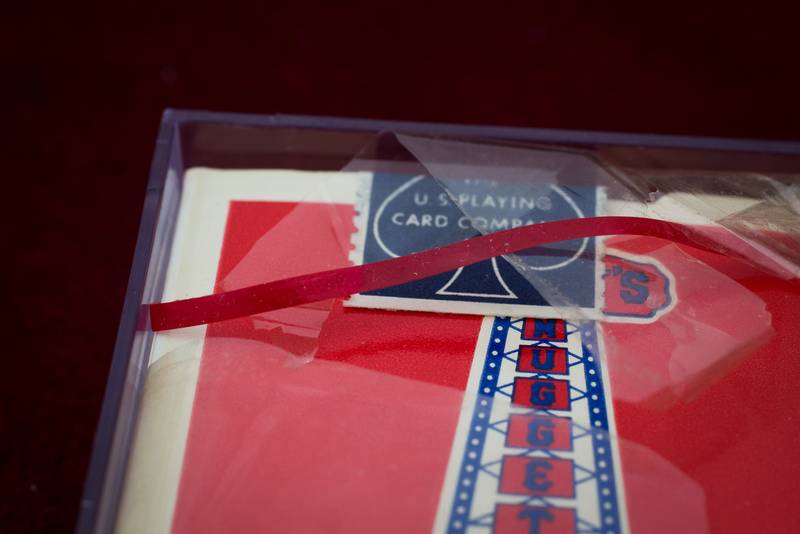 On real decks, the cellophane is closed by a red strip. 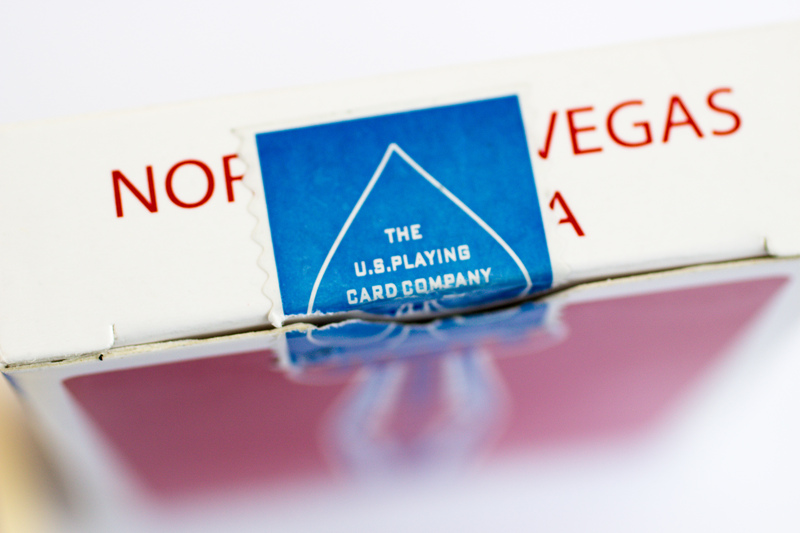 On most fakes, the strip is transparent just like the cellophane. 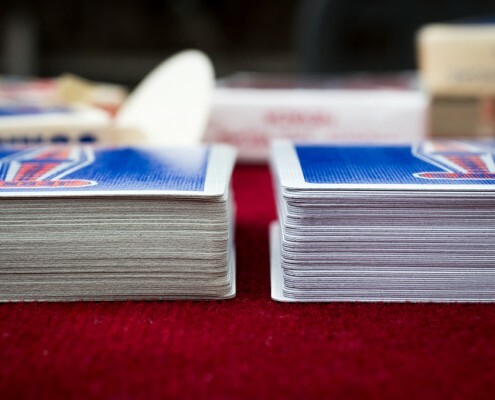 On real decks, the colored part of back of the cards has squared corners. 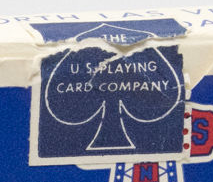 On most fakes, this part has rounded corners. 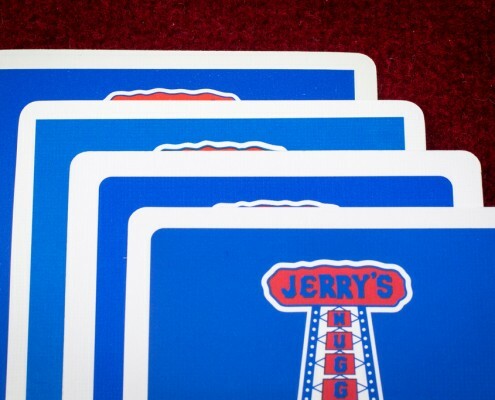 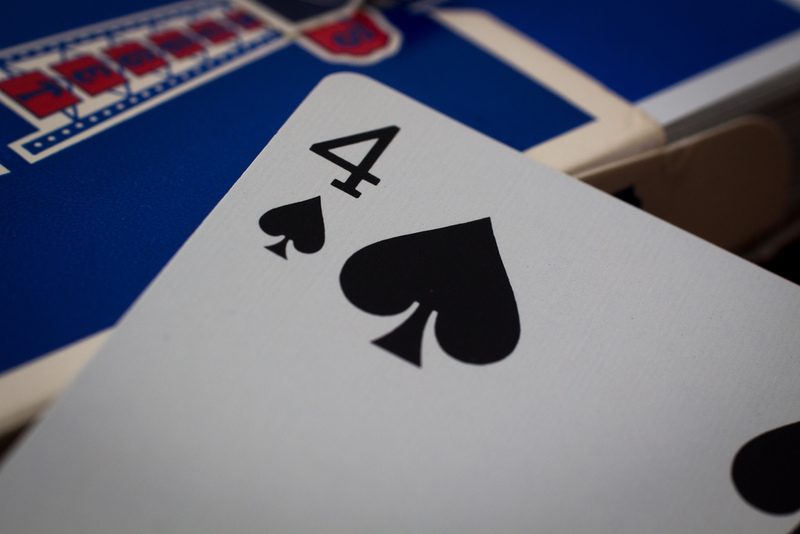 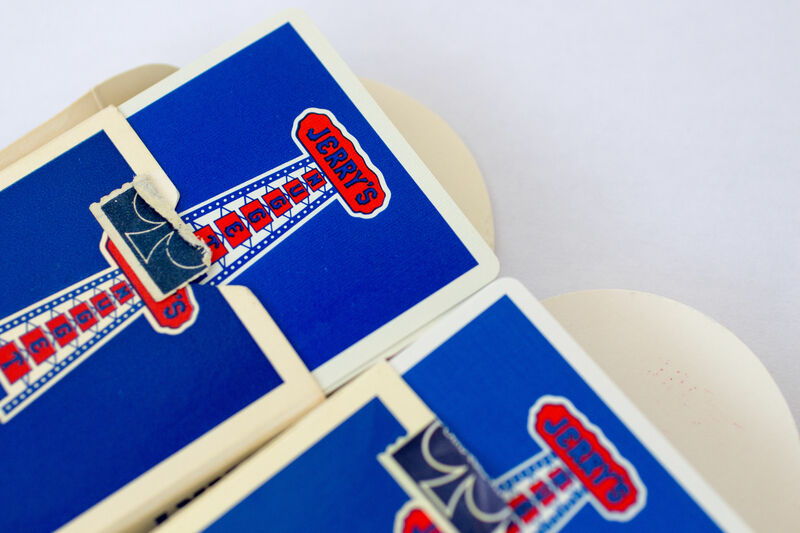 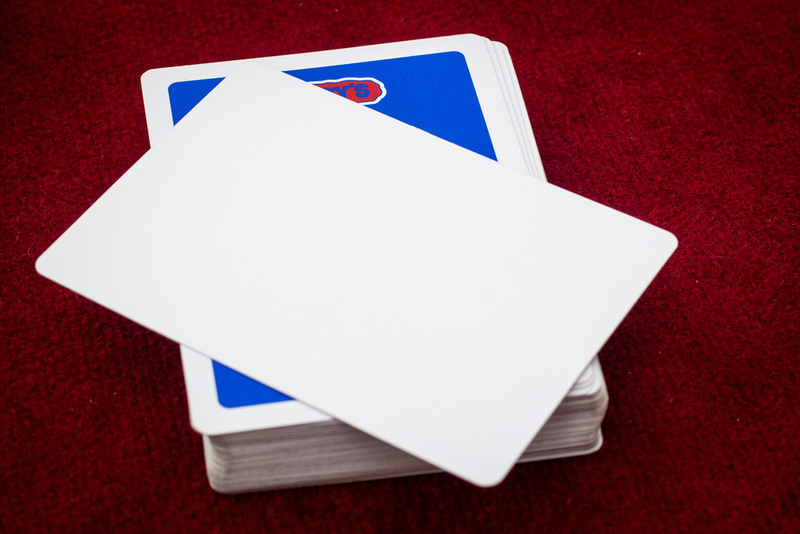 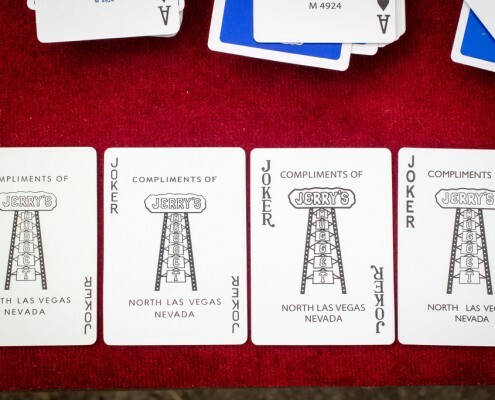 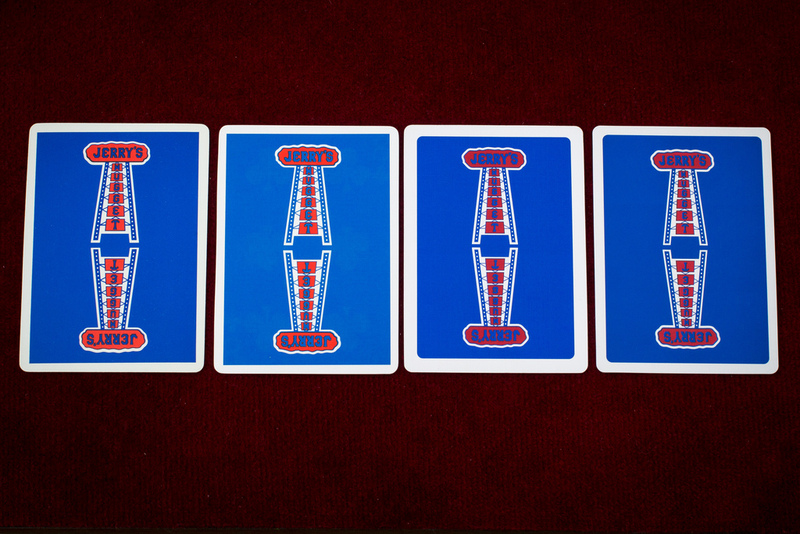 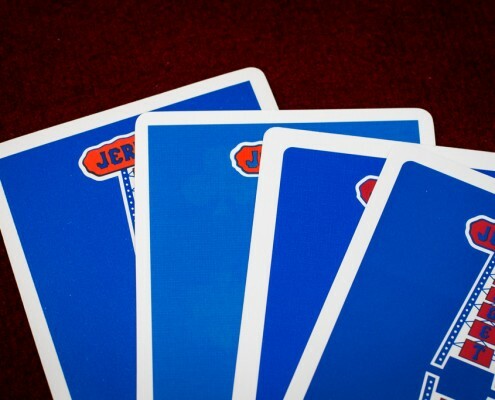 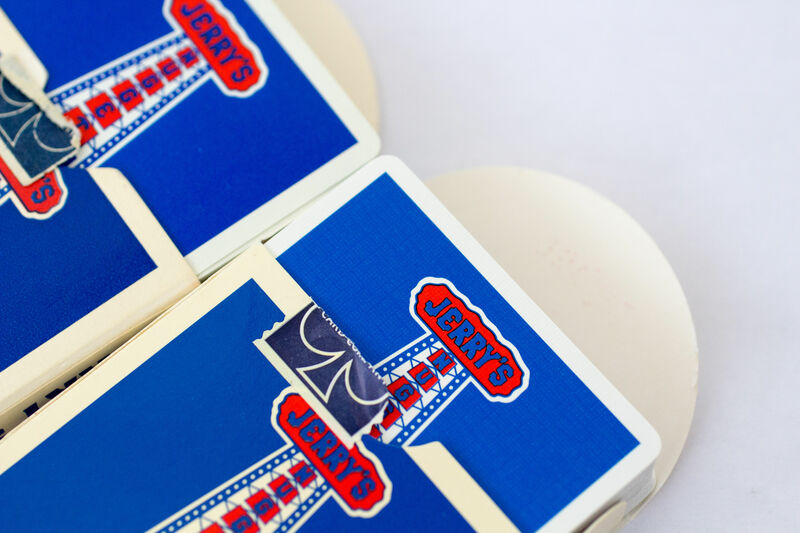 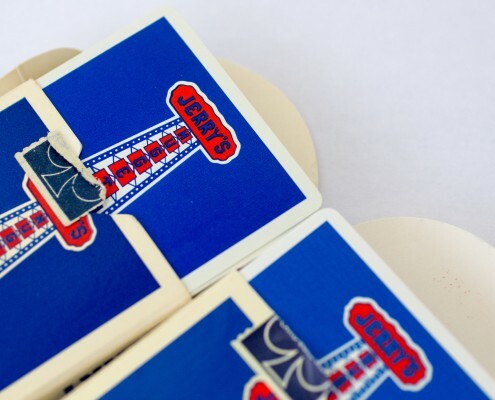 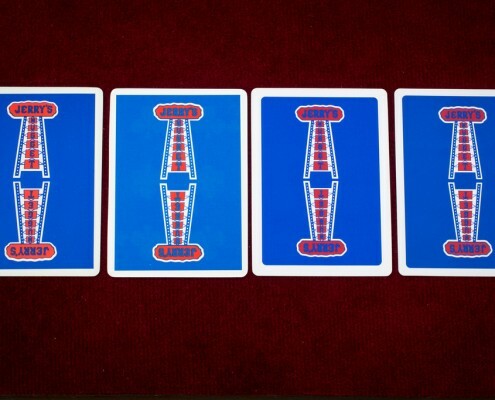 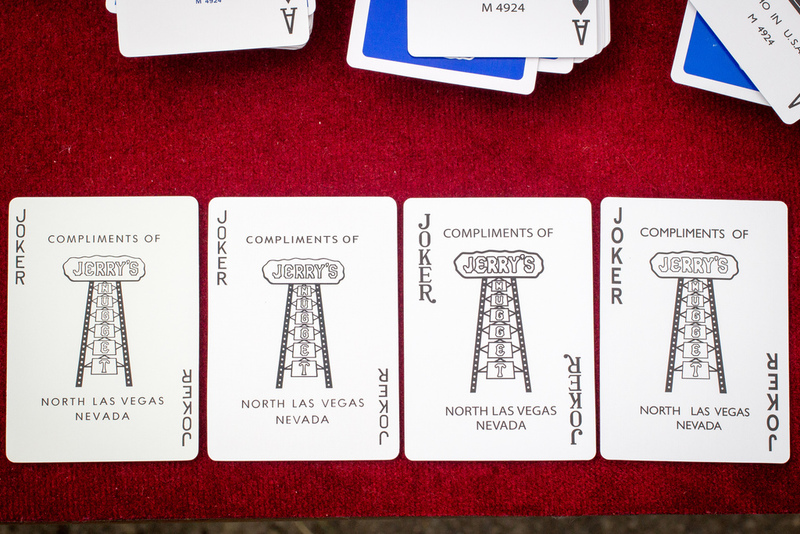 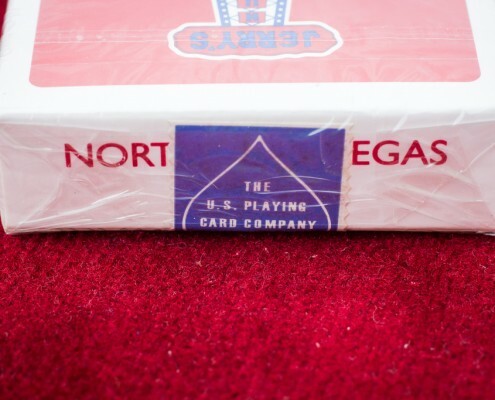 The real Jerry’s Nugget decks can only be found in two colors : Blue or Red. 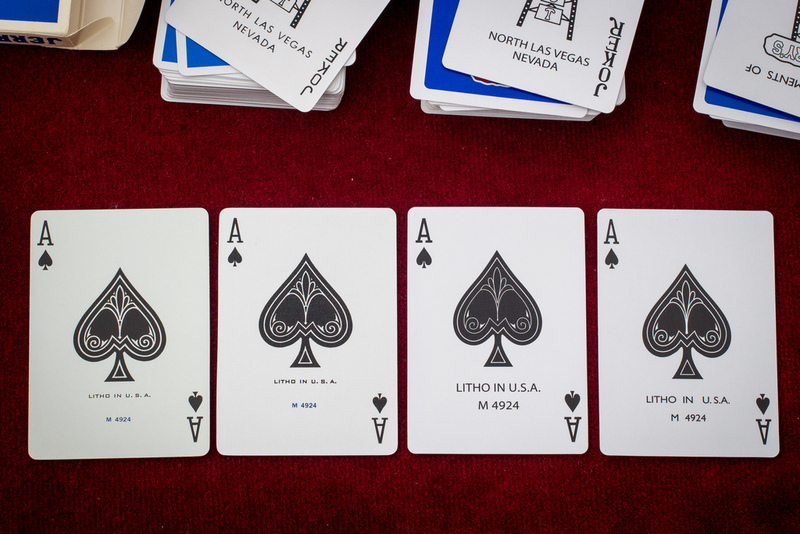 You can usually find Black cards on Ebay. 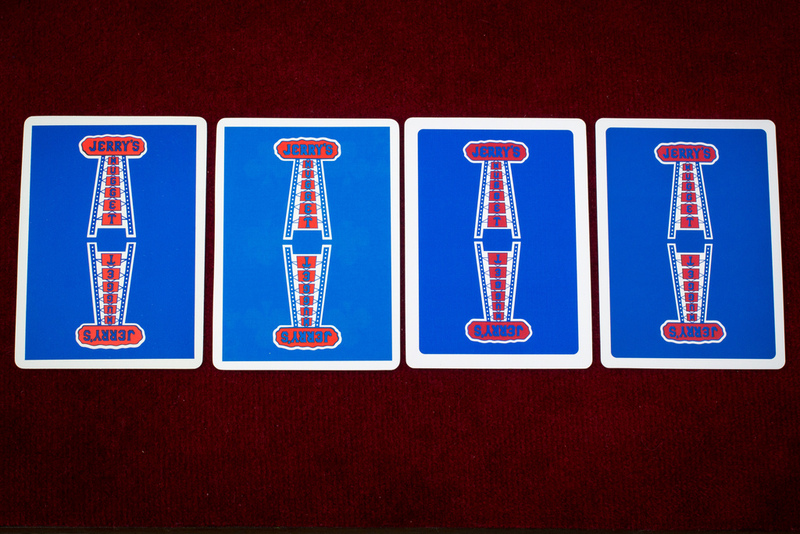 The deck is black, the back is black and the faces are in inversed color black. 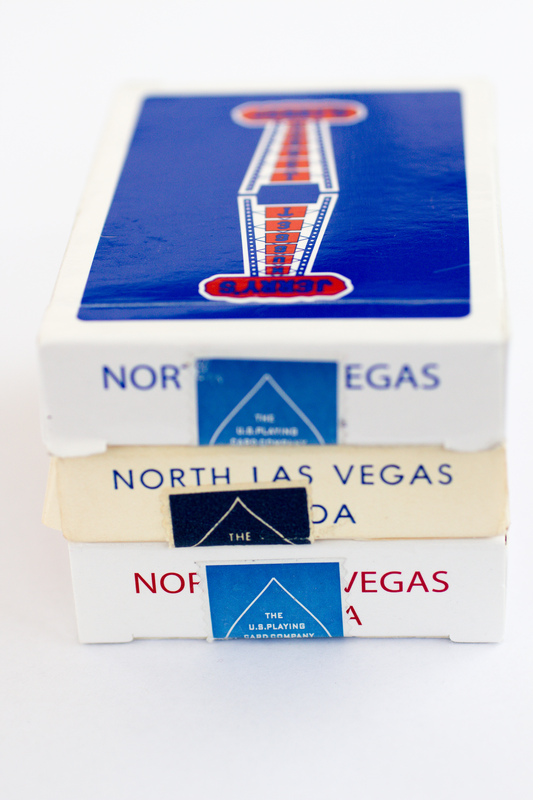 Orange decks are less usual but can be found. 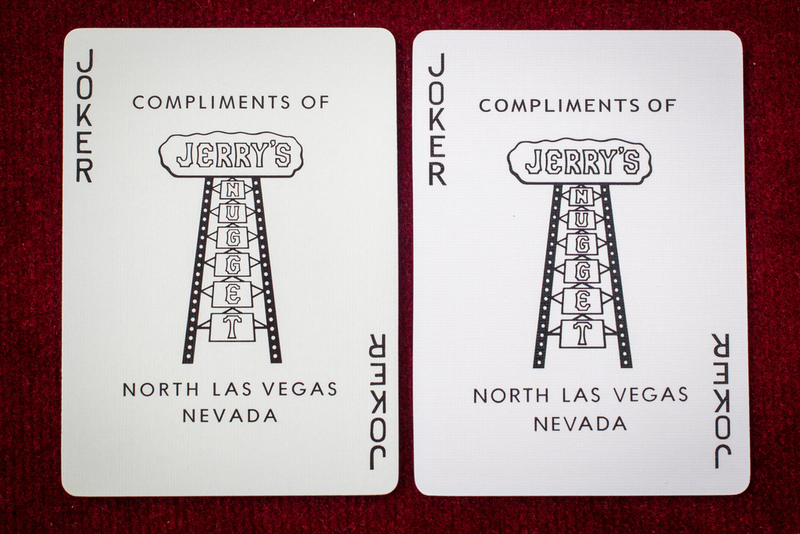 Green decks have been printed a very limited edition by fans of Jerry’s Nugget. 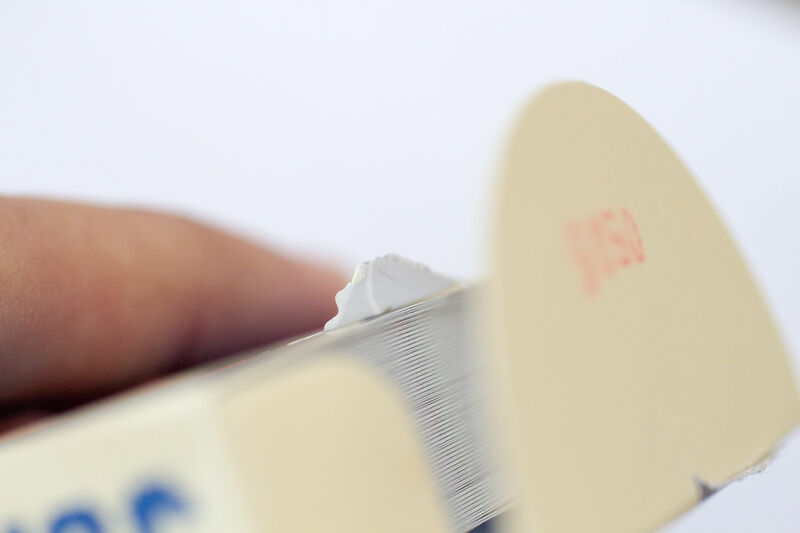 They are extremely rare. 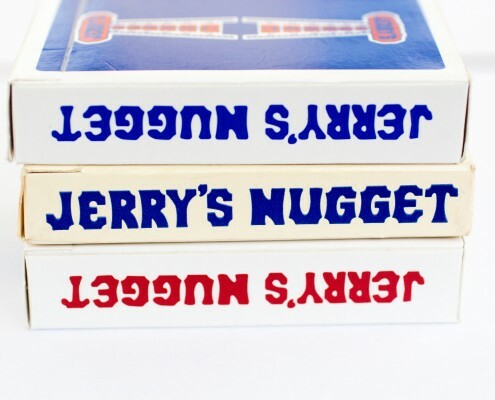 Real Jerry’s Nugget cards, thanks to their stock and finish, make a specific sound when dribbling. 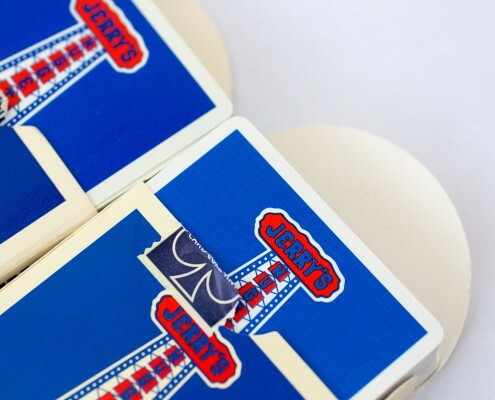 It is the same sound as most of the decks of the 70’s but different from the new decks. 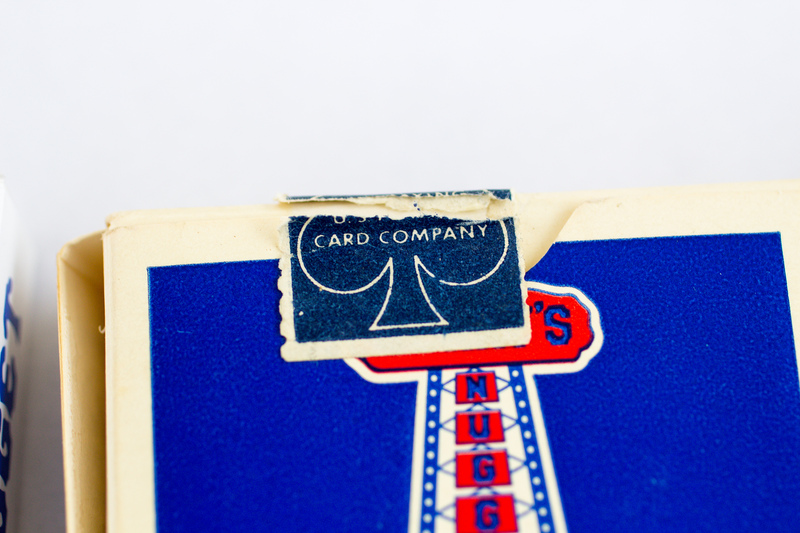 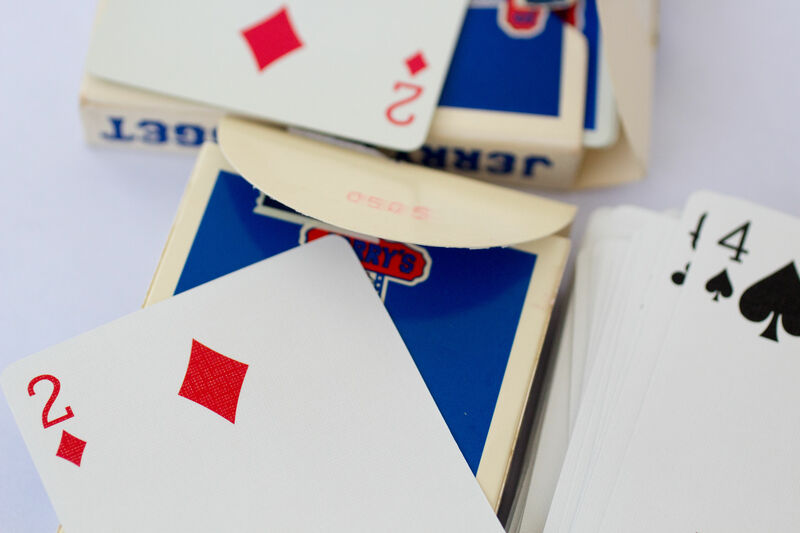 The cards of a real Jerry’s Nugget deck are thinner than most of the new playing cards. 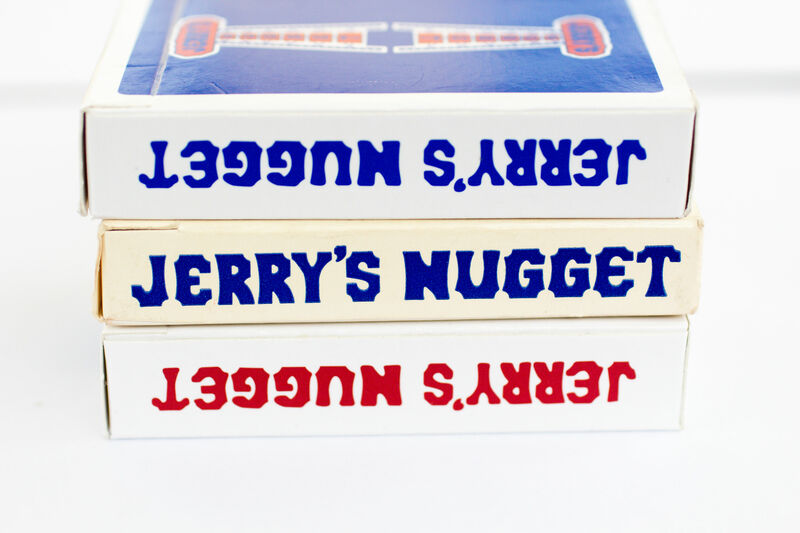 At least, thinner than all the fake Jerry’s Nugget. 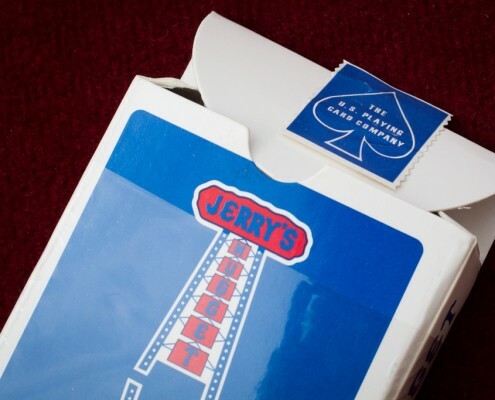 When you have a brand new, perfectly sealed deck of Jerry’s Nugget, it is difficult to prove the authenticity of the cards. 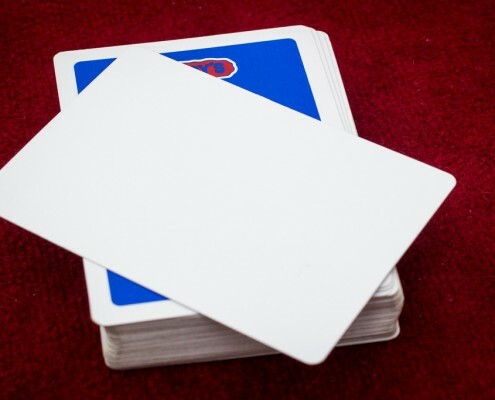 You can’t touch cards, you can’t use most of the tips I have given you before. 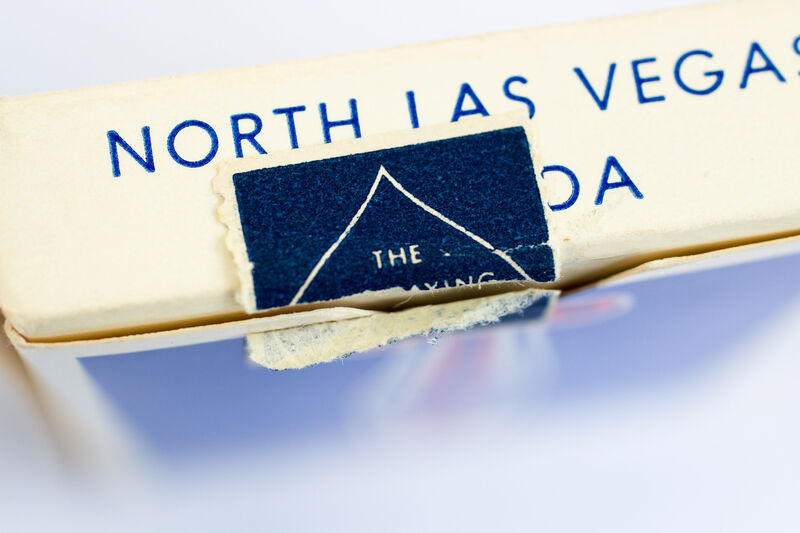 But there is one thing that will help you tell that it’s the real thing. 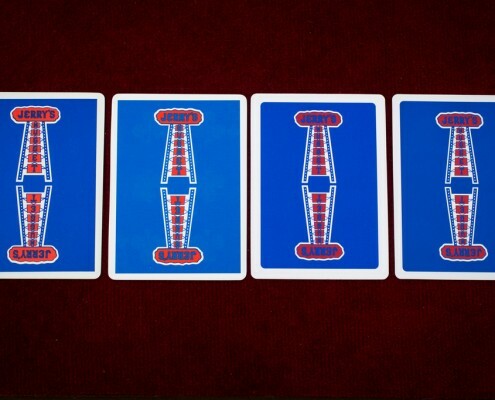 And it’s something tricky. 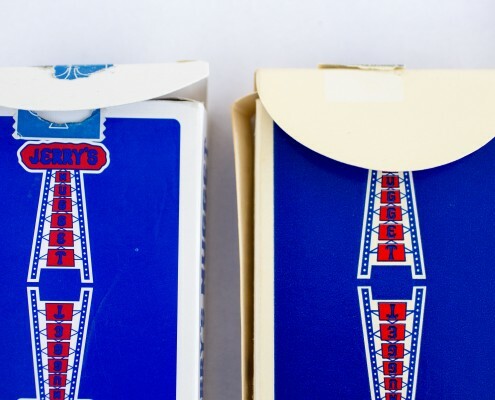 Left is straight, right is perforated, it’s the real McCoy ! 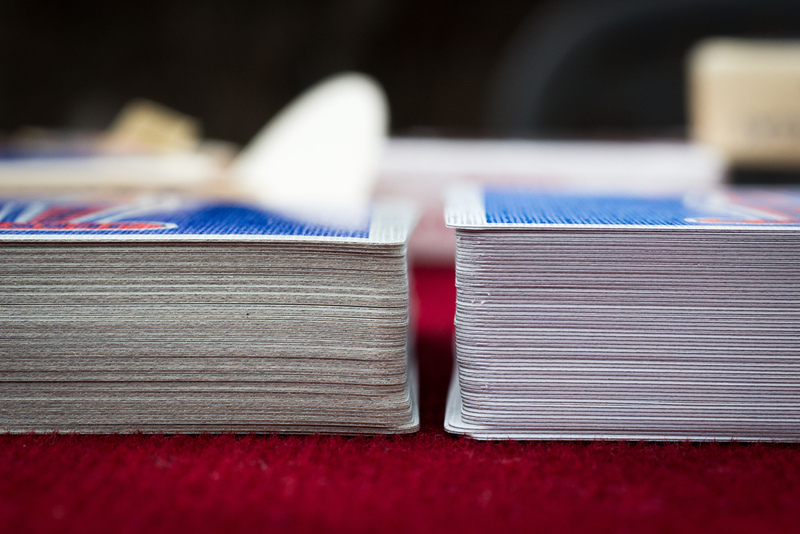 Real decks can only be opened from the top. 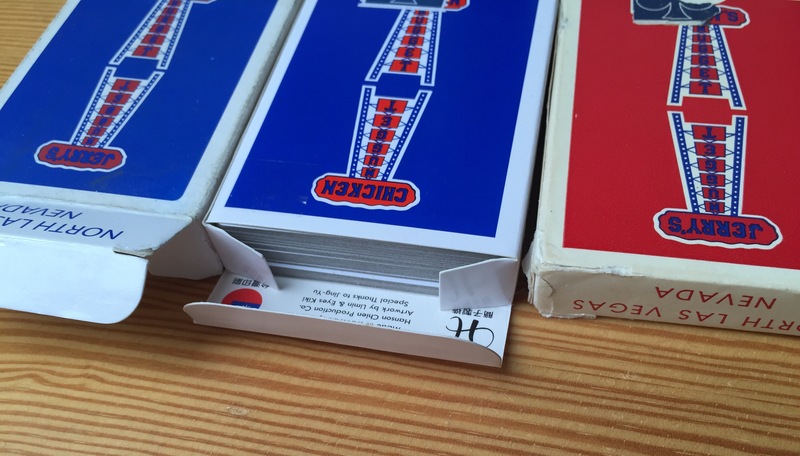 Some other fakes can be opened from the top and the bottom. 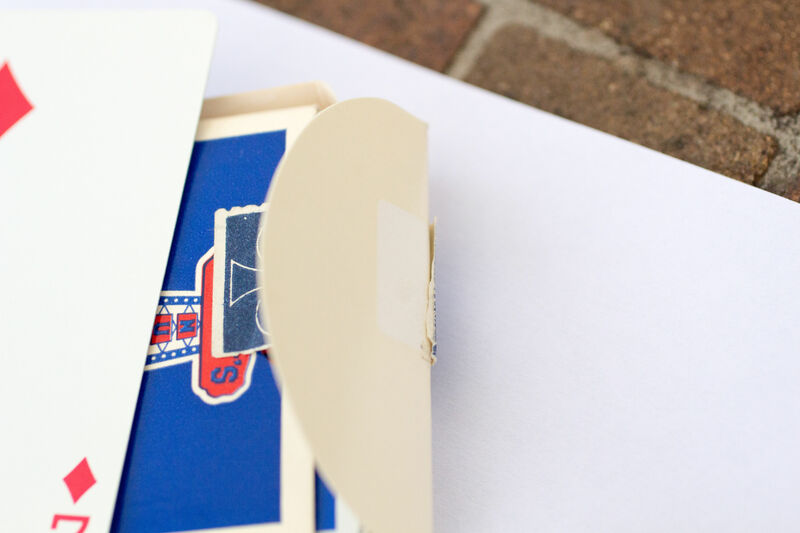 Of course, you can ask an expert to check photos or even cards. 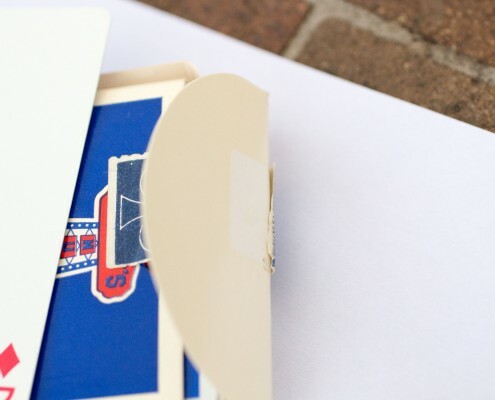 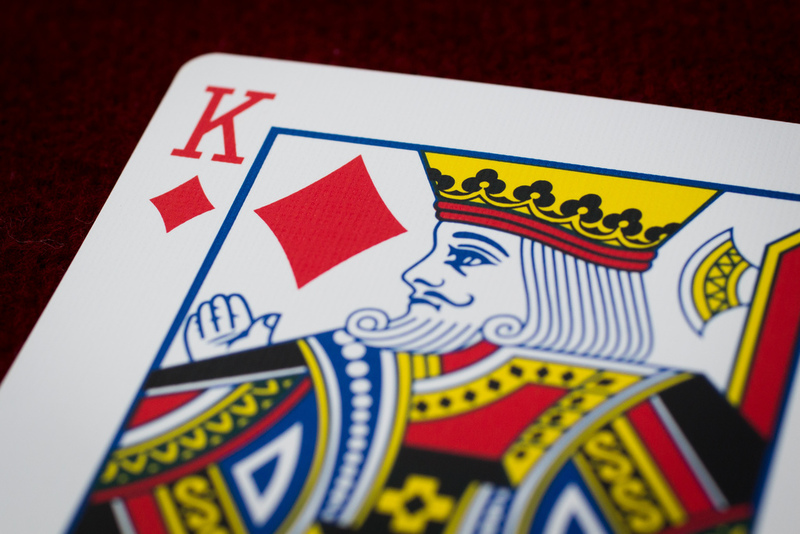 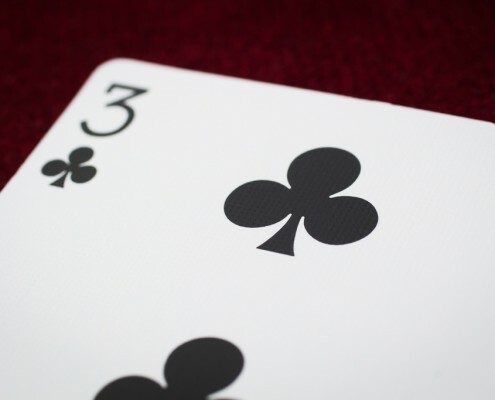 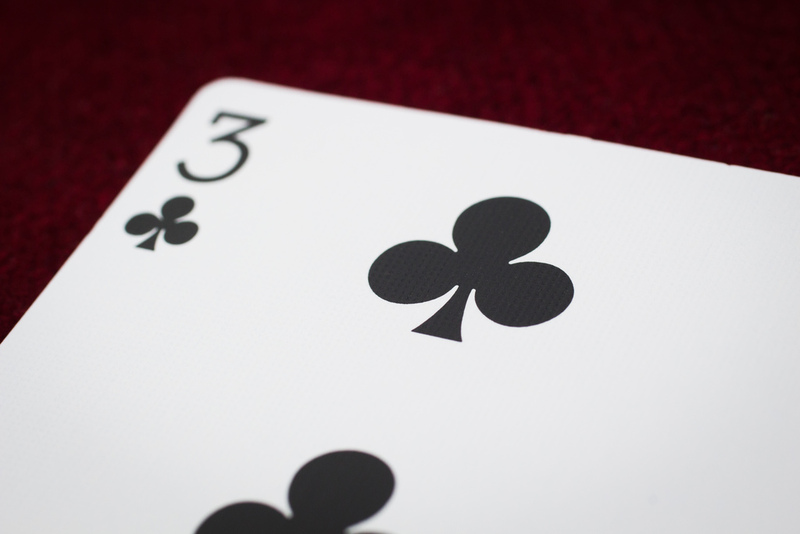 When an expert touches a deck, he can immediately say if it’s the real stuff or a fake. 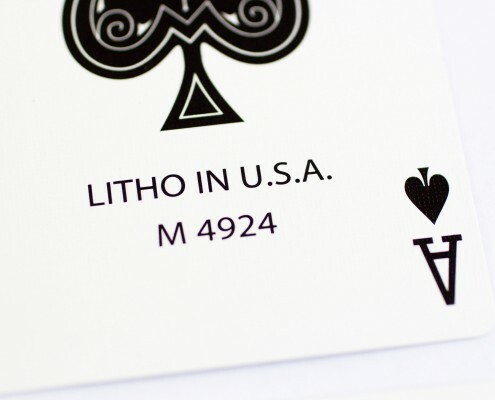 Real cards cannot be reproduced, they are unique. 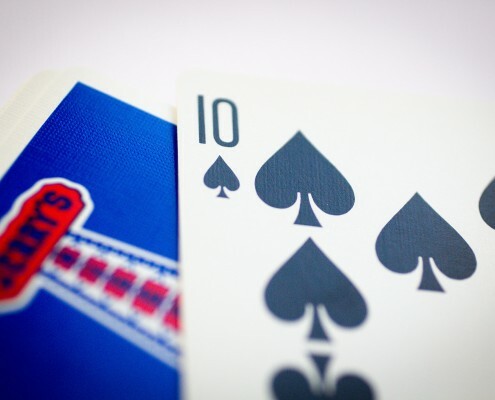 With photos, it’s also quite easy for an expert to find if the deck is real or not too.